Over the last few days I have featured the set of four paintings by the Flemish artist Joachim Beuckelaer entitled The Four Elements. On the first day the painting was subtitled “Water” and yesterday the subtitle of the painting was “Earth”. Today I am featuring the third painting of the set with the subtitle “Air” which was painted in 1570. In the “Water” painting we were shown a fish market and the connection with the Element of Water was that of the habitat of the food. The same went for the “Earth” painting when we saw the fruits and vegetables of the earth. Today with the subject “Air” we are treated to the sight of the “food” which occupies the air above ground, namely birds, fowl and rabbits. We are also treated to the sight of products which come indirectly from the land such as eggs and cheeses. We are at a poultry market and there is an abundance of food on offer. During Beuckelaer’s lifetime he painted numerous “market scenes” and at that time the art market was flooded with such a genre. Unfortunately for the artist once the art market became saturated with such paintings their value declined and the real value of Beuckelaer’s work did not become apparent until after his death. 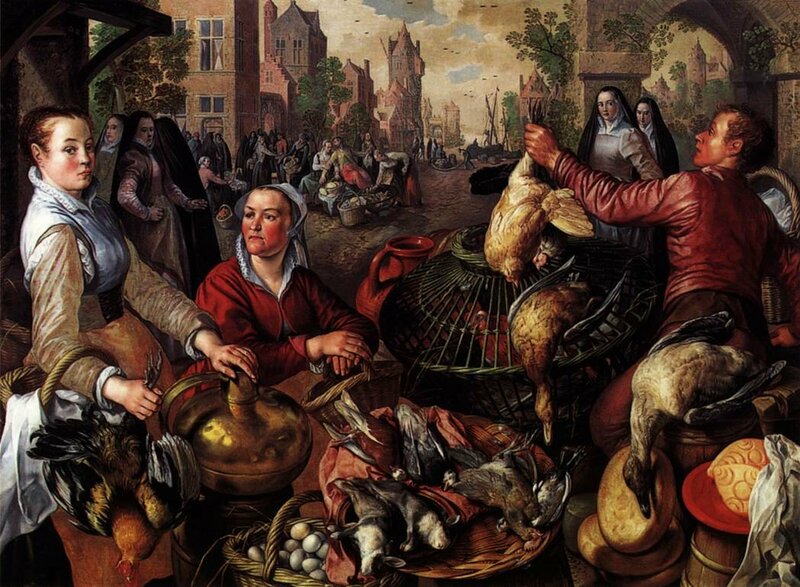 In the painting we see the rosy-cheeked stall holder sitting alongside the produce. It is a well-stocked market stall with a variety of dead fowl and small birds. We can also see inside a green wicker cage some live hens. The man at the stall, wearing the leather jerkin, has hold of a hen by its feet having just taken it out of the cage to show it to a would-be purchaser. To the left we observe a well dressed woman. She too is holding a hen in her right hand whilst her left hand rests atop a copper flagon which may contain milk or wine. In the central background we see a road leading to the sea with a small cargo boat just setting sail with the crewman starting to hoist the sails. On the quay we can just make out some barrels which have been off-loaded from the craft. So where is the Biblical story, which the artist is known to have incorporated into each of the four paintings? In this painting it is not as obvious. If however you concentrate on this road leading to the sea you will spot on the left hand side just behind some baskets of produce a man and a woman. She has her hand on his arm greeting him. He is leaning backwards against her, almost slumped. This was the Biblical addition of the painting by Beuckelaer, symbolising the Prodigal Son returning home. To me it seems as if he is inebriated and has just about made back home! Once again we have before us a very colourful painting, full of activity. I get great pleasure looking around the painting at the various charactyers and their expressions and try and work out what is happening and what the artist had in his mind as he put paintbrush to canvas.